Irvine, California & Guangdong Province, China – February 24, 2011 – Masimo (NASDAQ: MASI) and Royal Fornia Medical Equipment Co. Ltd. jointly announce a worldwide technology licensing agreement to integrate Masimo rainbow SET® Pulse CO-Oximetry™ technology into Royal Fornia's new generation of multiparameter patient monitors—enabling advanced noninvasive blood constituent measurements that help clinicians to detect and treat life-threatening conditions earlier. Having recently received State Food and Drug Administration (SFDA) approval for Masimo rainbow® SET parameters in China, Royal Fornia establishes itself as one of the first domestic Chinese medical device manufacturers to commercially incorporate Masimo's breakthrough noninvasive blood constituent measurement capabilities. Masimo rainbow® SET noninvasive and continuous measurements—like total hemoglobin (SpHb®), oxygen content (SpOC™), carboxyhemoglobin (SpCO®), methemoglobin (SpMet®), and Pleth Variability Index (PVI®), in addition to Measure-Through Motion and Low Perfusion performance of Masimo SET® oxyhemoglobin (SpO2), perfusion index (PI), and pulse rate (PR)—provide detailed physiological data that helps clinicians to more rapidly assess patients and detect adverse conditions much earlier. With rainbow® SET measurements, the ability to noninvasively detect internal bleeding, carbon monoxide poisoning, methemoglobinemia, fluid responsiveness, low perfusion, desaturations, and abnormal pulse rates quickly, easily, and continuously can help save lives and improve patient outcomes. Immediate availability of such detailed clinical intelligence and measurement data enables clinicians to proactively detect and treat the early signs of hemodynamic instability, potentially life-threatening conditions, and bleeding sooner rather than reacting to late indicators and their deleterious effects. According to Mr. Li Yang, Vice President of Royal Fornia Medical Equipment Co. Ltd, "Our corporate mission is to provide innovative medical devices with superior performance and value. The integration of Masimo rainbow® SET technology will allow us to design and manufacture state-of-the-art patient monitors that advance the delivery of healthcare. We expect that our combined product offering—Masimo's rainbow® SET measurements within our JCY-800-I and JCY-800-III multiparameter monitors—will provide clinicians with critical access to the latest cutting-edge technologies that allow them to more thoroughly assess a patient's physiological status and make better clinical and treatment decisions across the continuum of care." Masimo President of Worldwide OEM Business and Corporate Development, Rick Fishel, stated, "Royal Fornia's 'first-to-market' commitment and strategy provides its customers with easy access to an upgradeable platform of blood constituent monitoring parameters that provide new clinical intelligence and detailed physiological data to improve patient safety and care while optimizing reimbursement potential—all consolidated in their new portable line of multiparameter patient monitors. Royal Fornia has a history of developing innovative technology solutions to address previously unmet clinical needs, and we are very pleased that Masimo's unique rainbow® Pulse CO-Oximetry platform is a key component in their new portable patient monitors. " Masimo (NASDAQ: MASI) is the global leader in innovative noninvasive monitoring technologies that significantly improve patient care—helping solve "unsolvable" problems. In 1995, the company debuted Measure-Through Motion and Low Perfusion pulse oximetry, known as Masimo SET®, which virtually eliminated false alarms and increased pulse oximetry's ability to detect life-threatening events. More than 100 independent and objective studies demonstrate Masimo SET provides the most reliable SpO2 and pulse rate measurements even under the most challenging clinical conditions, including patient motion and low peripheral perfusion. 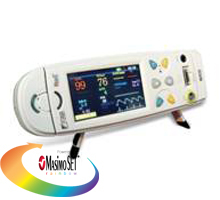 In 2005, Masimo introduced rainbow® SET Pulse CO-Oximetry™ technology, allowing noninvasive and continuous monitoring of blood constituents that previously required invasive procedures, including total hemoglobin (SpHb®), oxygen content (SpOC™), carboxyhemoglobin (SpCO®), methemoglobin (SpMet®), and Pleth Variability Index (PVI®), in addition to SpO2, pulse rate, and perfusion index (PI). In 2008, Masimo introduced Patient SafetyNet™, a remote monitoring and wireless clinician notification system designed to help hospitals avoid preventable deaths and injuries associated with failure to rescue events. In 2009, Masimo introduced rainbow Acoustic Monitoring™, the first-ever noninvasive and continuous monitoring of acoustic respiration rate (RRa™). Masimo's rainbow SET technology platform offers a breakthrough in patient safety by helping clinicians detect life-threatening conditions and helping guide treatment options. In 2010, Masimo acquired SEDLine®, a pioneer in the development of innovative brain function monitoring technology and devices. Masimo SET and Masimo rainbow SET technologies can be also found in over 100 multiparameter patient monitors from over 50 medical device manufacturers around the world. Founded in 1989, Masimo has the mission of "Improving Patient Outcomes and Reducing Cost of Care� by Taking Noninvasive Monitoring to New Sites and Applications®." Additional information about Masimo and its products may be found at www.masimo.com. About Royal Fornia Medical Equipment Co. Ltd.
As a China-US joint venture, Royal Fornia Medical Equipment Co. Ltd. was founded in 2000 and is engaged in R&D, manufacturing and distributing of high-end medical electronic devices. Now, it has comprehensive sales network and well-developed after-sales service, which further facilitate and improve the promotion of its products. We are a group of professionals who follow the concept of "Human-oriented technology" and it contributes a lot to Royal Fornia's rapid growth. Under the guidance of our business philosophy "Health Care for Better Future," Royal Fornia will always pursue the advanced technologies and outstanding product quality, and will devote itself to the making of an excellent corporation in the high-tech industry. For more information visit: www.rfornia.com. This press release includes forward-looking statements as defined in Section 27A of the Securities Act of 1933 and Section 21E of the Securities Exchange Act of 1934, in connection with the Private Securities Litigation Reform Act of 1995. These forward-looking statements are based on current expectations about future events affecting us and are subject to risks and uncertainties, all of which are difficult to predict and many of which are beyond our control and could cause our actual results to differ materially and adversely from those expressed in our forward-looking statements as a result of various risk factors, including, but not limited to: risks related to our assumptions that Masimo rainbow SET Pulse CO-Oximetry provides detailed physiological data that helps clinicians to more rapidly assess all patients and detect adverse conditions much earlier; risks related to our belief that rainbow measurements can noninvasively detect internal bleeding, carbon monoxide poisoning, methemoglobinemia, fluid responsiveness, low perfusion, desaturations, and abnormal pulse rates quickly, easily, and continuously for all patients; as well as other factors discussed in the "Risk Factors" section of our most recent reports filed with the Securities and Exchange Commission ("SEC"), which may be obtained for free at the SEC's website at www.sec.gov. Although we believe that the expectations reflected in our forward-looking statements are reasonable, we do not know whether our expectations will prove correct. All forward-looking statements included in this press release are expressly qualified in their entirety by the foregoing cautionary statements. You are cautioned not to place undue reliance on these forward-looking statements, which speak only as of today's date. We do not undertake any obligation to update, amend or clarify these forward-looking statements or the "Risk Factors" contained in our most recent reports filed with the SEC, whether as a result of new information, future events or otherwise, except as may be required under the applicable securities laws. Masimo, SET, Signal Extraction Technology, Improving Patient Outcome and Reducing Cost of Care� by Taking Noninvasive Monitoring to New Sites and Applications, rainbow, Pulse CO-Oximetry, Pulse CO-Oximeter, SpHb, SpOC, SpCO, SpMet, PVI, rainbow Acoustic Monitoring, RRa, Radical-7, Rad-87, Rad-57, Rad-8, Rad-5, Pronto-7, Pronto, Patient SafetyNet, and SEDLine are trademarks or registered trademarks of Masimo Corporation.